The history is divided by years, find your trucks year to see what was happening. I placed various ads from over the years, with some general pics. Take a look. AMC opened the 1986 model year with some modifications to the line. Cut after a six year run was the CJ-8. Over the coarse of its 5-year production run, 27,292 of the unique trucks were made. Prompting its discontinuation was the presentation of a new entry with a more-traditional pickup-truck design. Like how the full-size Wagoneer had provided a basis for the Gladiator, and later J-series, pickups back in 1963, the downsized Cherokee spawned into the new Comanche. The new pickup rode an XJ platform stretched to provide a 119.6-inch wheelbase. It also shared the Cherokees Quadra-Link front suspension, and the body was the same from the doors forward. The bed was a 7.5-foot-long cargo bed. The new truck used the Cherokees 4, and 6 cylinder engines and transmissions. The engine choices shared with the cherokee were 3. You could get the 2.5L TBI 150 C.I. I-4, rated at 117 HP at 5000 RPM, and 135 Ft. lb. of torque at 3000 RPM. Or opt for a little more torque, and get the GM built 2.8L 2 barrel, 173 C.I. V-6 rated at 115 HP at 4800 RPM, and 150 Ft. lb. of torque at 3500 RPM. If you wanted a diesel, you could get a Renault 2.1L 126 C.I. I-4, rated at 85 HP at 3750 RPM, and 135 Ft. lb. of torque at 2750 RPM. The diesel had the option of getting a factory turbo. For transmissions, if you wanted an automatic, your only option was the Chrysler 3 speed auto. On the other hand, if you preffered a manual transmission, you could either get the 4 speed AX4, or the 5 speed AX5. Selec-Trac, and Command-Trac four-wheel drive systems were available. Selec-Trac, allowed a full-time four wheel drive option, allowing a driver to engage four wheel drive on dry pavement, without having re-procussions to the drivetrain, or any damage. It also had the part time option, which locked both axles together, and provided better traction. With Command-Trac, four wheel drive was only available in a part-time option, which didn't allow the use of four wheel drive on dry pavement, because it didn't allow any differential action between the axles, and could subsequentally cause damage if good traction was recieved. The Command-Trac was listed for use on slippery of wet surfaces only to prevent this. The Comanche was available in three model packages, base, X, and XLS. Base being the lowest model, and XLS being the flagship, with all of the bells and whistles. The two-wheel drive model was the first Jeep pickup available without 4X4. Good news for Jeep, as 75% of the compact pickups sold were two wheel drive. Jeep Billed the new Comanche as a compact, but it really belonged to a rare breed, the mid-size pickup. It was bigger overall than any domestic or Japanese-built compact pickup. At 43.8 inches between wheel wells, its cargo bed was wider than any compact pickups, equaled in length only by the Chevy S10 pickup. With the 2205-pound maximum payload, the Comanches load rating was higher than either of Ford or Chevys entries into the field. But Comanche was smaller in size than any of the domestic pickups. A V-8 wasnt offered, and even though on models with a bench seat had three seat belts, squeezing in three full size adults was an uncomfortable experience. Another trait that set it apart from any other truck was the unibody construction. Regardless of its size category, Comanche would go on to win Four Wheeler of the Year honors from Four Wheeler magazine. It would also be an ample replacement for the aged J-series pickups, themselves entering their last model year. A new instrument panel and steering column shifter control marked the last of the J-series. From 1985, The 2.5L 4 cylinders ditched the 2 barrel carb, and got a throttle body fuel injection system instead. Horsepower climbed to 117 from 105 at the same 5,000 revs, while torque went to 135 at 3,500 RPM, from 132 at 2,800 RPM. The 4 now had 2 more horse than the optional 2.8L V-6, the V-6 had just 15 more foot-pounds of torque. Big changes marked the 1987 model year. Dropped was the CJ series, and power train upgrades were in for the Comanche, Cherokee, and its Wagoneer-trimmed cousin. Dropped was Chevys lame duck 2.8L V-6. The replacement was an AMC designed inline-6, 4.0L, which was named the Power tech six. Like the 2.5L AMC 4 cylinder that held strong, the new engine was based off the companys dated 258-cubic inch 6 cylinders. Unlike the 258 still continuing in the Wrangler, the new engine was Multi-port electronic fuel injection. The 4.0 shared a lot with the 2.5, like the combustion chambers, main bearings, connecting rods and bearings, oil pump, pistons, rocker arms, and lifters. Both had a 3.88-inch bore, but had different strokes, with the 2.5 at 3.18-inch, and the 4.0 at 3.44. Rated at 173 horses, the 4.0L had 58 more horse than the 2.8L V-6 it replaced. And at 220 foot-pounds of torque, it passed up the 2.8 at 75 more. Available as an option, it made the Comanche and Cherokee go from a few of the slowest vehicles in their class, to the fastest. Car and Driver described the new engine as the most potent power plant available in a vehicle of this type. Buyers who wanted a little less thunder in their Jeep could opt for the 2.5L, which got 4 extra horses(now up to 121 HP), and retained the same fuel injection system. The 85-horse turbo diesel Renault remained available outside of California. A new transmission also made head way, the 4 speed automatic, to replace the three speed Chrysler. Developed by Aisin Seiki of Japan and Warner Gear in the US, the gearbox had electronic shift controls and a 0.71:1 overdrive top gear. A switch on the instrument panel let the driver to select power or comfort modes. The power mode would make the transmission up shift at a higher RPM, down shift more quickly, and had greater throttle sensitivity to it. The comfort mode did exactly what its name stated, provided a comfortable ride, with more conventional shift points, and made for better fuel economy. A new manual transmission also surfaced with the new 4.0L. It was a five speed, made by the french gear company Pugeot. It was the BA 10/5. While being an ample replacement in the transmission line up, it would be found later that it had a few pitfalls, like reliability behind a very powerful new engine. As far as packages go, the X, and XLS were dropped. In their place, taking a cue from the vehicle it was spawned from, the cherokee, the Comanche picked up the Pioneer, Laredo, and Cheif models. The base remained on the line up. For 1987 Jeep made a concept Comanche, the Thunderchief, based on the Comanche. The Thunderchief featured aggressive fender flares, and a grille that was very similar to the one that appeared similar to the one that would appear on the Grand Cherokee years later. In 1987 the Comanche got the short-bed version with a 113-inch wheelbase and six foot bed. The grille became an 8-slot version of its former self. Chief and Laredo models were available in short bed Comanches. The Power Tech was the new engine option, and the new 4-speed auto was available. Dropped however, was the Selec-Trac, so now Comanches only came with the part time, Command-Trac. 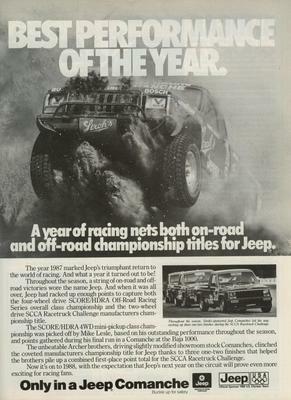 1987 was also the year Jeep got back into racing, compliments of a finance boost from Chrysler. Six full sponsored vehicles in competed in three series. 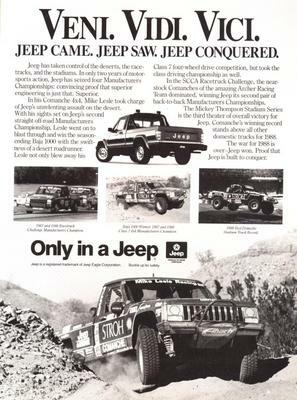 The Archer brothers in Jeep Comanche won the manufacturers championship in the SCCA Racetruck Challenge, while Mike Lesle added a second Comanche championship in the HDRA/Score Desert Racing series. Comanche sales hit an all time high of 38,094. 1988: Fine tuning and the Eliminator. In 1988, one of the first changes was a little tuning to the 4.0L, which increased the horsepower to 177, top in its class. The new more powerful 4.0L became standard on Cherokee Limited, and Wagoneer Limited. Gone after its dismal sales was the 2.1L I-4 Renault turbo diesel. Cherokee and Comanche got an updated 8 slot grille. Taking a hint from the Cherokee sport, Comanche got a new Eliminator performance model for 1988. Based on the 2 wheel-drive short-bed, the Eliminator came standard with the Power Tech six, tape graphics, color-keyed grill, fender flares, front air dam, and new 10 hole alloy wheels with 215/64HR14 tire. Inside was a tachometer, bucket seats, a sport steering wheel, and upgraded trim. With less weight than a Cherokee, a 4.0L Eliminator could easily smoke its rear tires on acceleration. 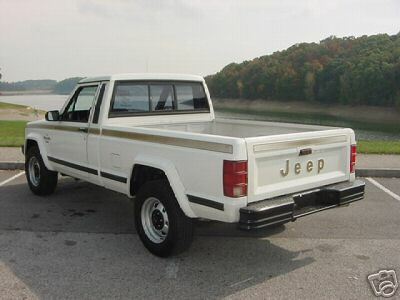 Also, inspired by the Olympic games in 1988, Jeep decided to release a limited edition option group package, The Olympic Comanche. A photo of what the Olympic edition looks like is pictured below. In 1989 the Comanche remained basically unchanged, while the Cherokee got 4 wheel ABS, and continued the rest of the year. The ABS system was designed by Bendix and kept the front disc, rear drum setup. It could be used in four or two wheel drive. ABS was an option on Cherokee models with the 4.0L, auto, and the Selec-trac transfer case. Unfortunately, the Laredo and Chief models were cut from the Comanche line. The Pugeot BA 10/5, affectively known as the Puke-goat, was discontinued, after its brief stint as a failure. While if taken care of, it could last a long time, it was too much of a problem to continue use of it. 1990: 4 Wheelin' the Eliminator. 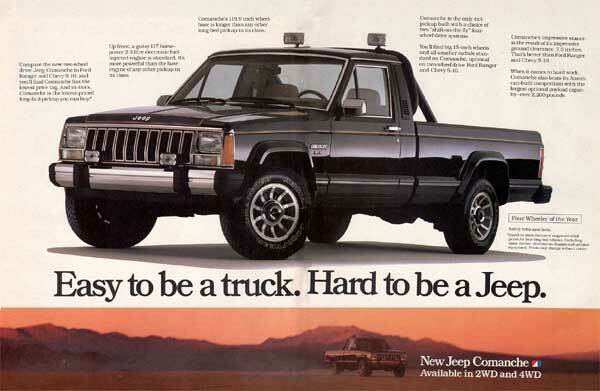 1990 was a slow year for Jeep, with Cherokee and Wrangler showing a drop in sales, a first for Jeep in a long time. Jeep powered on though, and their 1,000,000 Cherokee rolled off the line on March 22, a limited five door model, sent to the California coast, one of Jeeps strongest areas for sale. Overall, few changes in the Jeep line. The Comanche Eliminator was made available with four-wheel-drive, via the Command-Trac transfer case system. This was still the sporty street styled truck, which wasn't available with any skid plate groups, or off road accesories included in the package. The four-wheel-drive was just an item asked for by consumers in the sporty truck. The Pioneer remained the model with the off road packages, such as the bigger tire group, auxillary transmission cooler...Etc. 1991: New Power, but one foot already out the door. 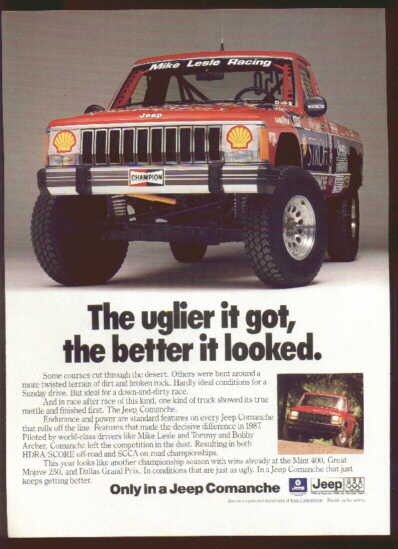 For 1991 Jeep turned up the competition by pouring on the power. Under hood, exhaust and intake systems were re-designed and rocketed the 4.0 to 190 horsepower, again making the 4.0 the most muscular engine in its class. Need for these engines were so strong, they were now standard on all Cherokees, except for the 2-wheel-drive base model. These were standard on Eliminators. The 2.5L also got a horse boost, thanks to multi-port injection as opposed to the single point TBI used in earlier versions. Horsepower was now up to 130. Comanche again, didnt gain any packages, or options, and had one foot out the door. 1992: Walking out the door. In 1992, despite lackluster sales, Comanche brought out a new sport option group, and some minor changes to interior trim. 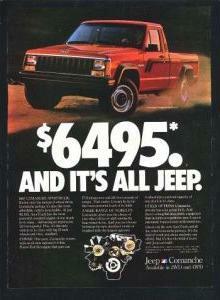 Jeep would only sell 3,181 Comanches for the 1992 calendar year however. That placed it last in a field of 11 compact pickups, and it would not be back the following year.